In the early morning hours of October 24, 1994, the first flight arrived at Frankfurt Airport’s sparkling new Terminal 2: a Cathay Pacific B747-400 jumbo from Hong Kong, carrying 350 passengers and 22 crew members on board. During the past two decades, more than 147 million passengers have been served at Terminal 2. 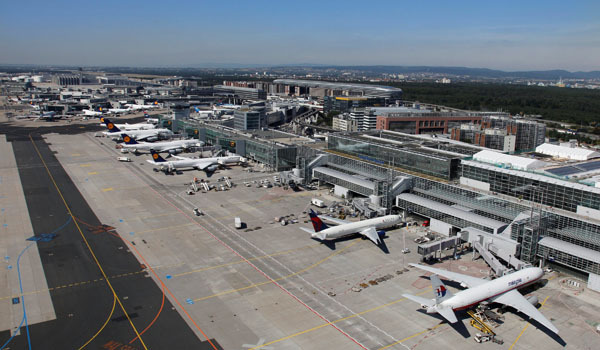 Frankfurt Airport (FRA) now marks the 20th birthday of this iconic terminal – which can be easily recognized when driving by the airport on the A3 autobahn near the “Frankfurter Kreuz” interchange. Designed by JSK Architects of Frankfurt, Terminal 2 set new standards in design and comfort. The spacious and airy architecture – suffused by natural light from the glass facade and skylights – enhances the overall air travel experience. With a total area of 306,000 m², Terminal 2 was the first passenger building to be built for the new generation of wide-body aircraft. Although “superjumbos” like the A380 were a long way from production at that time, the Frankfurt Airport company played a pioneering role in the industry by planning for the coming age of very large aircraft. Since 2005, when the first A380 arrived at FRA, Terminal 2 has meanwhile registered more than 1,200 movements with the world’s largest commercial passenger plane. A total of 18 airlines moved into the new terminal in 1994. Over the years, this figure has more than tripled to over 70 airlines from Europe, Asia and North America – including member carriers of the SkyTeam and OneWorld alliances (based in Halls D and E, respectively). In memoriam: A tragic event in the history of Terminal 2 occurred on March 2, 2011, when a lone terrorist attacked American soldiers on a bus in front of the terminal. The shooting resulted in the death of two persons and severe injuries to two others. The dynamics of the aviation industry have changed rapidly since the opening of Terminal 2. In 1994, FRA had to handle traffic surges of about 100,000 passengers on peak days back in 1994. 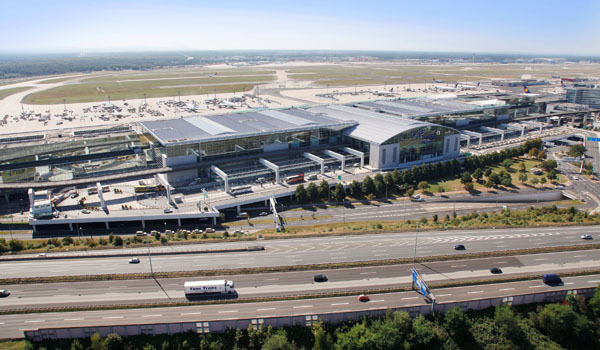 Today, FRA has to meet the needs of well over 200,000 passengers on peak days – also thanks to Terminal 2. A total of more than 147 million passengers have passed through Terminal 2 since its inauguration two decades ago. From the outset, Terminals 1 and 2 were integrated above ground via the elevated Sky Line people-mover shuttle train and below ground via a high-speed baggage transfer tunnel linking the baggage systems of both terminals. Thus, FRA’s 45 minute transfer time could still be maintained even for passengers switching from one terminal to the other. Inaugurated in tandem with Terminal 2, the Sky Line is a fully automated passenger transfer system that features a two-car configuration for shuttling up to about 120 people at a time. The free shuttle ride takes only about 90 seconds from Terminal 2 to the middle of Terminal 1. Terminal 2’s design standards have created a pleasant atmosphere. Open space and natural light enhance the well being of passengers, visitors and staff. The building facade comprises more than 30,000 m² of glass, plus an additional 8,000 m² of glass for skylights on the roof – together bringing sunshine and natural light into the check-in halls and other areas of the terminal. Premium flooring, made of grey granite-stone, is another characteristic of Terminal 2. This has certainly stood the test of time and has even found its place in Terminal 1, as part of major refurbishment projects completed at Terminal 1 in subsequent years and at the brand new Pier A-Plus opened in 2012. Terminal 2 is more than an architectural gem. It has become a favorite attraction – particularly for families and airport fans coming to the airport in their leisure time to visit the 2,730 m² Visitors’ Terrace, accessed via the Food Plaza on Level 4. Since 2005, 1.4 million people have enjoyed the panoramic view from the outdoor Visitors’ Terrace. Currently closed for refurbishment, the Visitors’ Terrace will reopen in spring 2015.